Happy Halloween again everyone! Once again, the treats are a-plenty on this holiday! Telltale's Dave Grossman has posted another one of his annual pumpkin pictures in The Pumpkin House of Horrors. He goes all out this year, with a total of eight carved pumpkins in the picture! 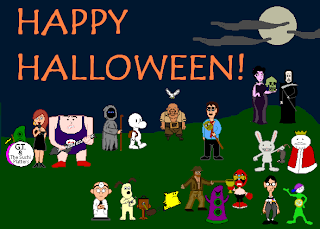 And, for the final piece of Telltale-related Halloween goodies, The 2009 Homestar Runner Halloween cartoon is out! Tales of Monkey Island Chapter 4: The Trial and Execution of Guybrush Threepwood is now available to season purchasers for the PC! Also, in November Telltale celebrates Wallace & Gromit's 20th anniversary by bringing a lot of Wallace & Gromit goodies out. All four episodes will be available on Xbox Live Arcade on November 4th. Also on that day, Telltale will begin taking orders for the Wallace & Gromit PC bonus DVD. The DVD is packed with goodies, including the complete set of Wallace & Gromit Cracking Contraptions short cartoons! Keep an eye out for more surprises from Telltale coming soon too. More Wallace & Gromit news should be coming soon, and Telltale's newest unannounced series should be announced soon, since it's in it's testing phase now! CSI: Deadly Intent is Out! Telltale's latest game based on the CSI Las Vegas series, Deadly Intent, is out now. The PC version will be able to be purchased and downloaded from Ubisoft's site on October 29th. The PC and Xbox 360 versions were developed by Telltale, but the Nintendo DS version was developed by Other Ocean. Brütal Legend, the second game from Double Fine Productions, is now out in stores in North America for PS3 and Xbox 360! Brütal Legend is the seventh game from the mind of Tim Schafer, who previously co-wrote the first two Monkey Island games (along with Ron Gilbert and Dave Grossman), and brought us Day of the Tentacle (along with Dave Grossman), Full Throttle, and Grim Fandango at LucasArts, and Psychonauts at Double Fine. The LucasArts puzzle platformer, Lucidity, is now out on Steam, Direct2Drive, and Xbox Live Arcade. If you are having problems running the game, this post on the Steam forums might help you. Brütal Legend Demo is Out for Everyone! The Brütal Legend demo release party is happening today. Yes, today is the day everyone who didn't pre-order Brütal Legend gets to try the demo out for themselves. A short promo video for the game is also out. The party will have interviews, a live Twitter Q&A, live axe lessons, and a message from Tim Schafer. And they will also be giving away some goodies! It all happens at Noon PST (GMT -5). Tim Schafer's 20 year anniversary! Tim Schafer is celebrating the anniversary of his 20th year in the video game industry with a retrospective of his quest to start a career in the video game industry in 1989, including the much talked about but never seen comic that he drew and included with his job application to LucasArts (then known as Lucasfilm Games).